Mobile Shredding — Mobile shredding services are perfect for any amount of paperwork up to 300 pounds (ideally 3-10 copy paper boxes). The truck comes to your home or office and shreds your paper while you watch in order to help prevent identity theft. The cost for mobile shredding is around $100. If you have more than three boxes but nowhere near ten, you can ask a friend, neighbor or other business to join you and share the cost. Drop Off Paper Shredding — The national average for drop off shredding is $1 per pound. One copy paper box full of papers usually weighs about 30 pounds. Since drop off shredding is charged by the pound, it is convenient to drop off your boxes of papers to be shredded at a retail location. You don’t get to witness your papers being shredded if you use the drop off service. Ship ‘N’ Shred — Similar to drop off paper shredding services, our “Ship ‘N’ Shred” service charges by the pound. The cost is approximately $30 for a 30-pound box of paper and $45 for a 65-pound box of paper. You can take them to a shipping location or have them picked up from your location and shipped off to be destroyed. Again, you don’t get to see your documents destroyed yourself, but you can get a certificate of destruction. Hard Drive Shredding — On average, hard drives cost between $4 and $12 to shred. The cost goes down as the number of hard drives you are shredding increases. Please take note: All of the prices listed vary based on your location, who you choose for your project, and some of the factors listed below. Be sure to contact us or fill out our form to get an accurate price for your project. Drop off services charge by the pound while mobile shredding or offsite shredding companies charge by the number of documents/boxes/trash bags you have. With hard drive shredding, the cost per hard drive decreases as the number of hard drives increases. The service that fits you best depends on how much you need to shred. As that number increases, it usually makes more sense to use a mobile or offsite shredding company rather than dropping your documents off at a retail location. Proximity to professional shredding companies located in your area factor in to the price of your project. Mobile and offsite shredding companies that travel to you factor in the distance they have to travel in your quote, so if you live on the outskirts of town, it might cost a little more than if you’re in the heart of a metro area. Are There Any Extra Steps That Need to Be Considered? Any additional steps to the process affect the price of your project. Be sure to provide any additional requirements with your quote request to make sure you get as accurate a quote as possible. Gathering bins from multiple locations or having the driver travel up a flight of stairs could increase the price. If you have any more questions on the cost of your next shredding project, or simply would like to get a free, no-obligation quote right away, give Shred Nations a call at (800) 747-3365 or fill out the form on the right. 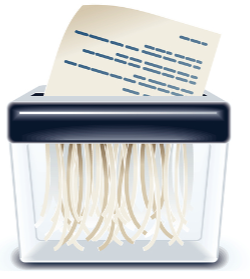 In just minutes, you will receive free, customized quotes from local document shredding services.